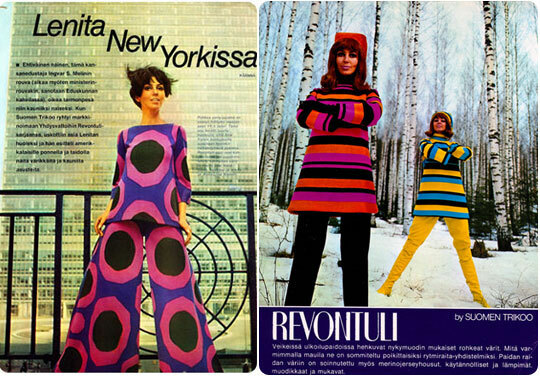 In Finland, the 1960s was an era of beauty. Finns were mesmerized by industrial design in just about everything: clothes, accessories, jewellery, furniture, tableware, utensils and interiors. After the long grey years of wars and shortages, cheerful colours and new forms were intoxicating. Many Finnish design products were born in the 1950s and by the 1960s they attracted widespread international attention with their originality and modernistic outlook. Industrial designers were like a new combo that composed and developed a completely new sound and beat. It carried away people and compelled them to look towards the future instead of the grey past. Along with recovery of the home market, exports picked up in a number of sectors with more and more companies dispatching salesmen to central Europe and the United States. People abroad were amazed how a country that had just barely survived two destructive wars followed by ten tough years of severe shortages was suddenly able to generate export products of dazzling colours never seen before. Launching of the Revontuli collection in the USA. In January 1966, senior industrialist Valdemar Jensen, managing director of Suomen Trikoo, the largest textile and clothing manufacturer in the Nordic countries with a workforce of more than 4,000, presented Lenita Airisto with an alluring offer. 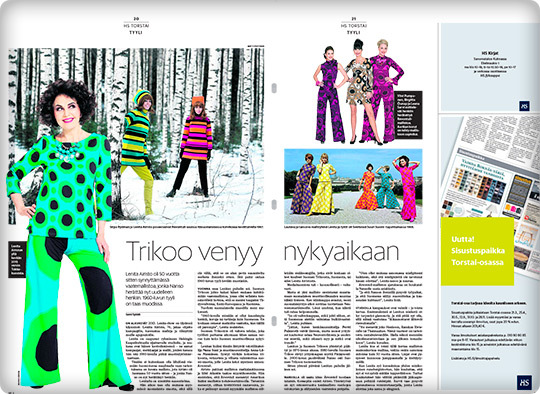 Suomen Trikoo needed a flagship collection to establish a ‘high design’ profile that the current fashion required. The idea was to market the new collection in Sweden and the USA. Lenita Airisto accepted and began to develop the REVONTULI (Northern Lights) designer collection with designers Nana Suni and Anna-Liisa Nieminen. She spearheaded the marketing effort for the collection on the west and east coasts of the USA and in Sweden. The range sold well for several years. Lenita Airisto terminated the REVONTULI agreement at the turn of the 1970s when Suomen Trikoo began to focus on exports to the Soviet Union instead of exports to the west. Why is Tampere not a fashion hotspot? asked journalist Juha-Veli Jokinen from the Aamulehti newspaper. 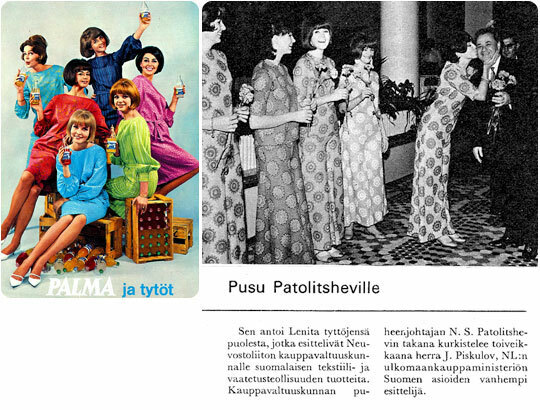 A blaze of colour from the golden era of Finnish design and fashion in the 1960s returned in 2012 when Nanso signed an agreement with Airisto Oy, owner of the REVONTULI (Northern Lights) concept. Lenita Airisto became the creative coordinator of the REVONTULI by NANSO collection. 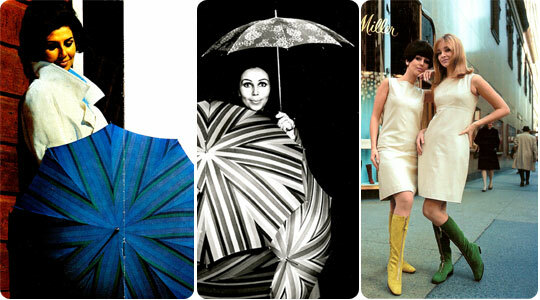 Marjatta Metsovaara created the colours for the Top Tip umbrella export collection. Launching of Pertti Palmroth’s boots and footwear in the USA. Sales and marketing services were soon ordered by other companies. Palmroth, a family-owned company in Tampere, entered the US and Canadian markets with Pertti Palmroth’s colourful winter boots proving to be a bit of a sensation on Fifth Avenue. Marjatta Metsovaara’s colour schemes differed from everything seen until then and her Top Tip umbrellas were a hit in the high-end department stores in the USA and Canada. There was an incredible dynamism and vitality to design in the 1960s. It also inspired people to look for new ways to promote sales and exports. Lenita Airisto assembled a team of five top models known as LENITA & LES GIRLS/TYTÖT to display colourful Finnish designer clothes. When she added song and dance to the performance, the show was polished to perfection. The time was so ripe for new things that LES GIRLS immediately became a hit. They went to the recording studio, had a TV show of their own, and adorned official functions with their presence. But above all they toured Scandinavia, Europe and the Middle East presenting Finnish fashion. Lenita & Les Girls. The top models adorned official east-west trade functions with their presence. Sales and exports promotion campaigns became a new service product. 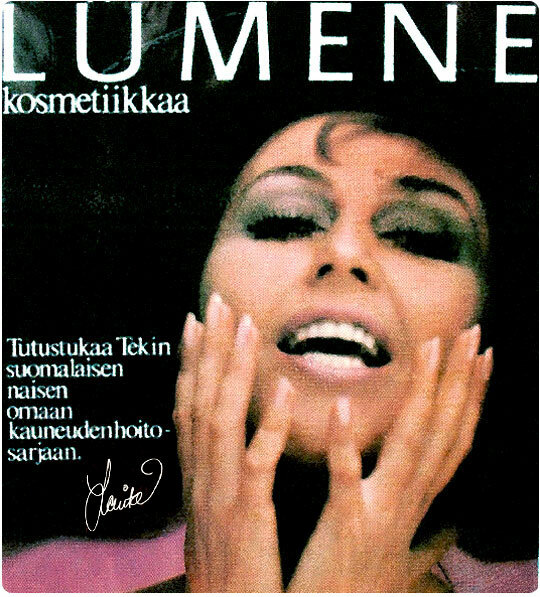 When Noiro, an Orion Group company, launched the Finnish LUMENE cosmetics range in 1971, it signed a contract with Lenita Airisto under which she worked for years to develop, publicize and market the range. 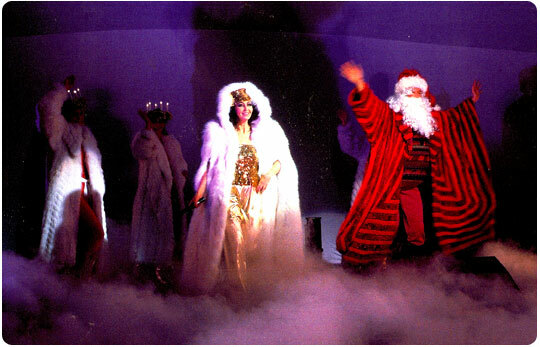 The contract included a number of flashy show tours and campaigns in Finland and the Nordic countries. She also became the first face to advertise Lumene products. The first face to advertise Lumene products. 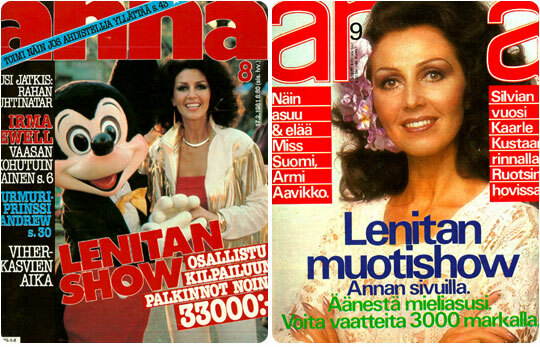 Over several years, Lenita Airisto’s services were retained to design and stage fashion-related campaigns in Finland for women’s magazines such as Me Naiset and Muoti + Kauneus as well as department stores like Pukeva and Sokos. Export-oriented companies such as Friitala Fashion needed promotion tours for its leather products in Europe; Lapponia Jewelry invested in an extensive show tour in Canada and Finlayson was eager to attract media and consumer attention to its interior fabrics in New York. The Lapponia Jewelry promotion tour in Canada. 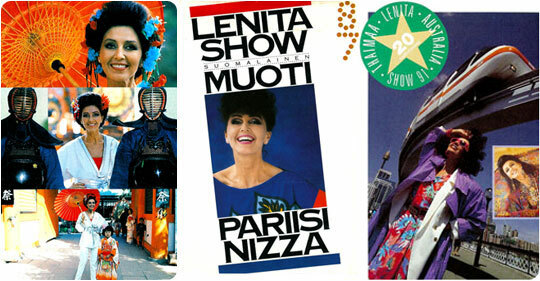 Over the years, the customer profile changed with the addition of companies like Veho/Mercedes Benz for which Lenita Airisto staged an extravagant 100th Anniversary Show. Finnpap, the Finnish Paper Mills’ Association, ordered a Paper Doll show for a large international customer event. Two major Japanese forestry, paper and pulp companies, Marubeni and Minatoya, booked the show for its stand at the Osaka World Design Expo. Elcoteq, a Finnish electronics company, retained her services to stage a show and shoot a video for the Teleregatta held in Estonia. Japanese forestry, paper and pulp companies Marubeni and Minatoya booked the Paper Doll show for their stand at the Osaka World Design Expo. The off-the-peg garment and accessories industry expanded to the extent that during its heyday it employed more than 30,000 people, mostly women. New designers and entrepreneurs were constantly emerging and new ideas were being embraced without reservation. The clothes, furs, footwear, stockings, bags, jewellery and lingerie made in Finland were so beautiful that no one ever thought of buying anything from abroad. Finnish products were simply superior. 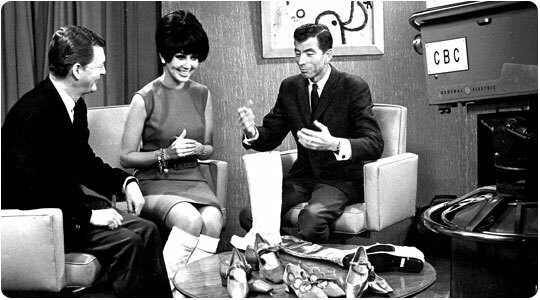 Off-the-peg clothing manufacturers, retailers and fashion magazines were busy implementing their own sales promotion campaigns aimed at consumers. 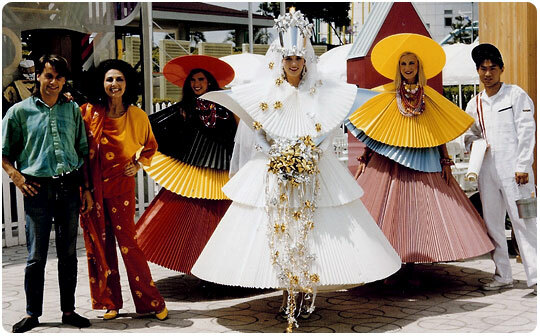 This gave Lenita Airisto the idea of staging joint fashion shows targeting ordinary consumers. 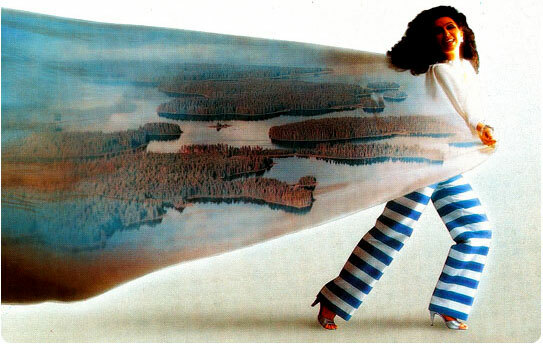 This idea was first tried out in September 1972 when 23 companies, department stores, retailers and boutiques presented their new autumn designs. While the event proved to be a success, something more was needed, and that something was provided by another hit product - tourism. The LENITA FASHION AND TRAVEL SHOW is portrayed in the Anna magazine. The final product - the LENITA FASHION AND TRAVEL SHOW - was a multimedia and stage show of the highest technical standard. The video images and slides shot by Airisto Ltd’s photo team and projected onto a giant screen took the viewers to exotic locations while showing close-ups of jewellery and other products. Although the fast-paced fashion show carried away the audience it was, at the same time, a tightly coiled marketing product. 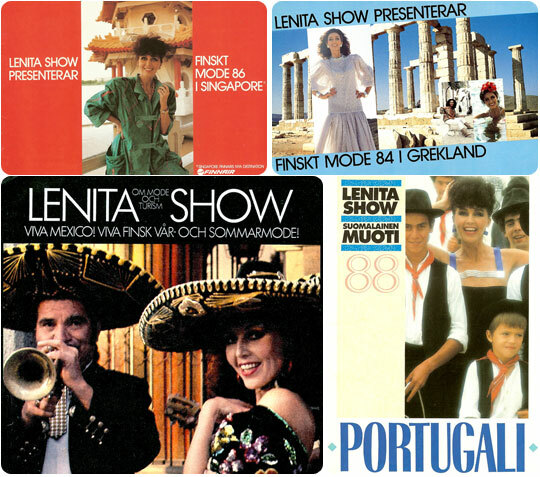 The Lenita Show reshaped conventional fashion shows. 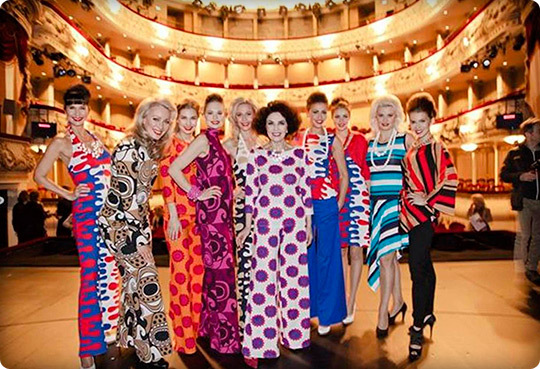 Over the years, all the leading and most successful Finnish clothing companies such as Marimekko, Nanso, Luhta, Friitala, Grünstein, Vuokko, Finnflare, Annikki Karvinen, Lapponia and Lumene took part in the show. All products promoted during the tours were immediately available to consumers from Sokos department stores and several speciality boutiques, which ensured the display and the availability of the clothes and accessories throughout their outlets in Finland. The fashion products and holiday destinations were lavishly portrayed in the women’s magazine Anna, one of the partners, which also made use of the tours to cultivate its own customer contacts and attract new subscribers. The LENITA FASHION AND TRAVEL SHOW tours in Scandinavia presented fashion and tourism around the world. As Finnair opened new routes to various parts of the world, the travel show brought the new destinations to the attention of the target audience. Finnair reached its customers through local travel agencies and many tour operators adjusted their customer meets to coincide with the show’s tour schedule. Admission tickets were sold by charitable organizations which, in turn, earned a sizeable share of the proceeds for their causes. The success achieved in Finland inspired Airisto Ltd to expand its market area. Airisto Ltd, the company owned by Lenita Airisto, honed the original marketing strategy to perfection. 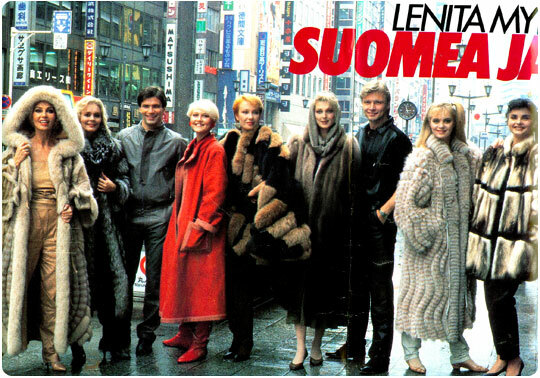 Over the next 20 years, the company produced a series of Finnish fashion and travel shows in Finland and Scandinavia that played to full houses and reached tens of thousands of consumers each year. As well as high-end Finnish fashion, the multimedia show presented the following holiday destinations: Spain, Kenya, Thailand, Morocco, New York, Brazil, Georgia, Mexico, California, Japan, Greece, Gambia, Senegal, Cap Verde, Hungary, Singapore, France, Portugal, China, Egypt and Australia. Finnair starts non-stop flights to Beijing and China opens to Finnish business. Exotic destinations from Disneyland in California to the Red Square in Moscow. CREATIVE FINLAND starts its world tour. Creative Finland show in the Beacon Theater in Broadway, New York. Creative Finland show in Ginza and Yubin Chokin Hall in Tokyo. 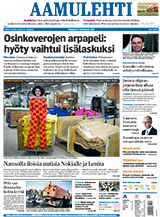 The Creative Finland world tour received much attention in the international media. In the autumn of 1972, the Finnish Association of Foreign Trade (currently Finpro) ordered the main event for the Munich Fashion Week at the Finnish stand from Lenita Airisto, followed by a tour of a number of cities in the Federal Republic of Germany and later Sweden. 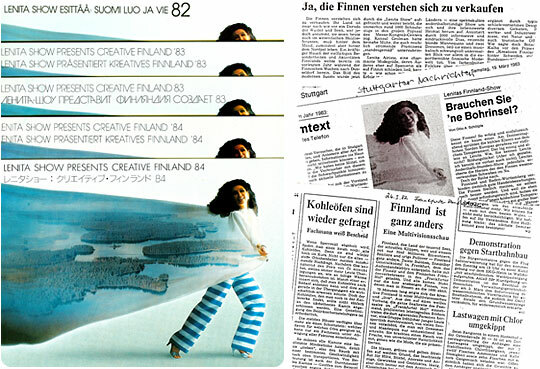 The project represented the first experiments with a new type of visual image marketing for Finland abroad. Its reception exceeded all expectations. 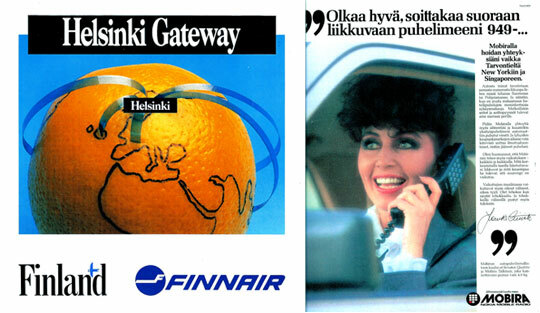 Finnair and Nokia open new gateways for the Finns to the world. ”When you sell Finnish products abroad, you also have to sell Finland as a modern western country. The product assortment should also clearly show that we are definitely not part of the ’Eastern block’.” This was Lenita Airisto’s basic tenet. The idea was brought home in the CREATIVE FINLAND and SUCCESS STORY FINLAND world tours produced by Airisto Ltd. The SUCCESS STORY FINLAND show on a world tour. 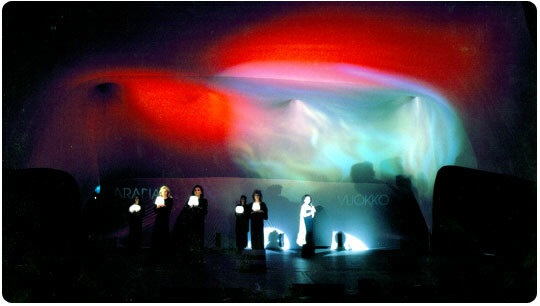 The impressive stage and light show, accompanied by Finnish music, was combined with the most advanced multimedia technology available at the time. A total of 35 slide and 3 video projectors were used to project images of Finland onto a screen measuring 5 by 25 metres. Images included views from untouched nature, culture, design, art, industry and people. The audiences learnt about Finnish companies and their products. 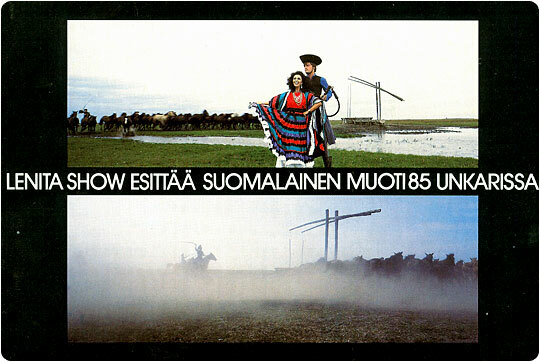 As well as promoting the interests of participating companies, the intensely visual shows were also intended to influence people’s perception of Finland. The leading role in the show was played by the major-league export industry and international services: Finnair to which the international media and foreign customers were an extremely important target group; Nokia whose mobile phones were just about to hit the market to become an unrivalled success on the world trade scene; and Finnpap representing the forest and paper industry - the cornerstone of Finland’s national wealth at that time. Not to forget, of course: Valmet Paper Machines; Neste Chemicals; Rauma Repola’s oil-drilling rigs, ships and underwater exploration vessels; Wärtsilä’s ice-breakers; luxury cruisers and diesel engines; Nautor’s Swan yachts; Finlandia Vodka; Arctia; Viking Line; Polar-Express; Finla by Finlayson and Marja Kurki and the Finnish Tourist Board. Additionally, there were the Kansallis Banking Group’s worldwide investment activities and the international insurance services offered by the Pohjola Insurance Company. All these firms paid to advertise their products on the Finnish Success Story tours - a project that received substantial funding from the Ministry of Trade and Industry. While Finnish culture, art, design and fashion were extensively exhibited, this time they served as a backdrop for the success story of Finnish industry. The world tours promoting Finland’s image targeted locations important to foreign trade. 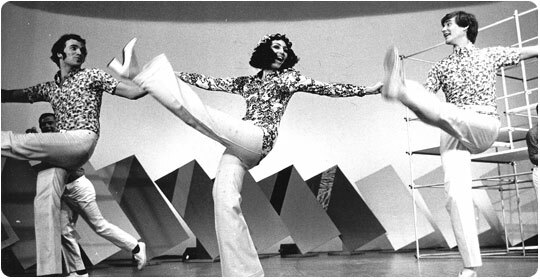 In many cities, the show was performed over several days and a number of places were revisited at a later date: Stockholm – Oslo – Gothenburg – Malmö - Copenhagen- Hamburg – Frankfurt – Munich - Stuttgart – Cologne – Amsterdam – Brussels – Antwerp – London – Vienna - Zurich – Hannover – West Berlin – Düsseldorf – Baden Baden - Moscow – Tokyo – Singapore – New York - London – Amsterdam - Singapore -Stuttgart – Frankfurt – Düsseldorf – Hamburg – Munich - Tokyo – Beijing - Paris and Madrid. 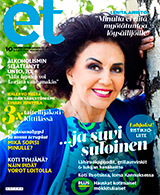 The success Story Finland world tour received much attention in both Finnish and international media. 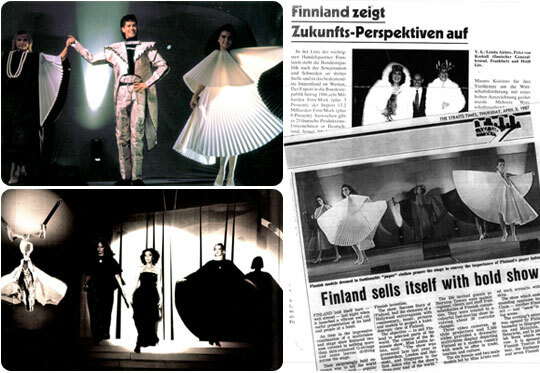 The SUCCESS STORY FINLAND show, designed and directed by Lenita Airisto, was also a hit in China, being covered on the national TV news and in the print media. And how were these world tours rated by the companies that had invested large amounts of money in the venture? During the course of the tour in Germany, Finnair held an opening ceremony for its Hamburg office; KOP Luxemburg celebrated its 10th anniversary; Finnpapier held receptions and a total of 14 sponsor companies hosted cocktail parties, lunches and dinners. Round-eyed. Scenes showing how Finns spend their free time had a hypnotic effect. Shooting the rapids and acrobatics on skis made the audiences gasp for breath while ice-fishing and gold-panning raised some eyebrows. And the audiences burst into fits of laugher when wife candidates were presented to the bachelor farmers in Sumiainen. “Great fun and exhilarating! Everything very much clean-lined: design, culture, in fact the entire lifestyle. What a fast-paced show!” were just some of the comments heard after the performance. as Lenita Airisto’s spectacular show of little Finland’s success in the word ended to a brief but energetic applause last night in Paris. Dhassy, the international editor of Le Figaro, a newspaper with a circulation close to one million, knows Finland very well. He thinks that the 45-minute multivideo stage show clearly conveyed the message that Finland is a free and affluent country.” Iltasanomat. The Finns know it…if anybody! Finland is a great success story because the Finns have always had confidence in themselves and their abilities. Santa Claus lives in Finland – something every child knows! For her achievements as a businesswoman on the international export scene, Lenita Airisto has been appointed Woman of the Year and been awarded the Distinction of First Class by the Order of the Lion of Finland. Today, Lenita Airisto makes efficient use of her learning, experiences and networks through her books and lectures. The show was recorded by VipVision and shown on Channel 3 on Independence Day eve, 5 December 1987. The programme was followed by a studio panel on Finland’s image attended by: Pertti Salolainen, Minister of Trade and Industry Pertti Huitu, CEO, Finnish Association of Foreign Trade Matti Törhönen, CEO, Advertising Agency Turkama and Eija Malmivirta, Director, Neste The panel was chaired by Seppo-Heikki Salonen. The TV programme is shown on this web site courtesy of Nordisk Film & TV’s CEO Antti Väisänen, Heikki Lehmusto and Kalervo Kummola. 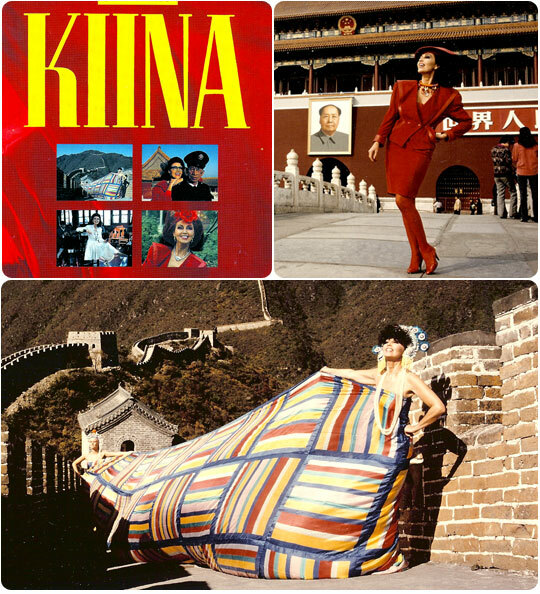 A striking show promoting Finland in Beijing on 1 November 1988 in the Great Hall of the People conveyed images of Finnish industry, design and culture to an audience of 6,000. Airisto Oy’s main partners in China were Finnair, which opened direct flights from Helsinki to Beijing at that time, and CITIC (China International Trust and Investment Company). SUCCESS STORY FINLAND was a great hit receiving extensive coverage in the national news on Chinese TV and in the print media. Designed, directed and produced by LENITA AIRISTO. 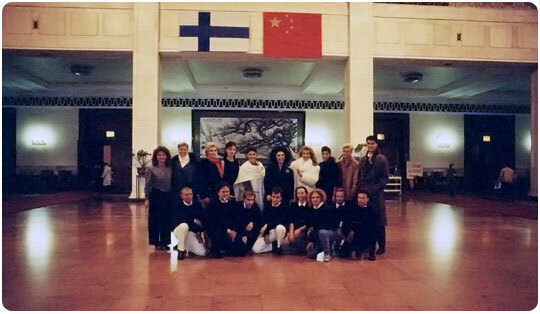 For the Success Story Finland Show team, the absolute culmination of the tour was performing on the stage of the gigantic Great Hall of the People in Beijing. Finnish top models projecting a true stage presence. Hair by Sirpa Mansner/Beauty Hair. 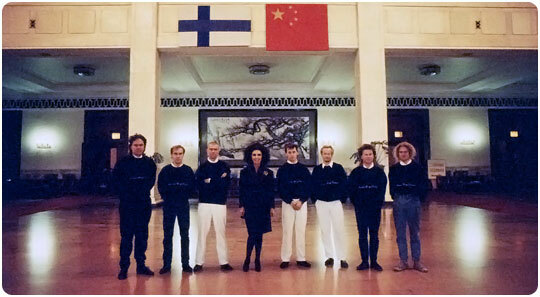 The Success Story Finland show in the Great Hall of the People in Beijing on 1 November 1988, was recorded by VipVision and shown on Channel 3 on 5 December 1988. Finnpap’s part in the Success Story Finland show was much admired. 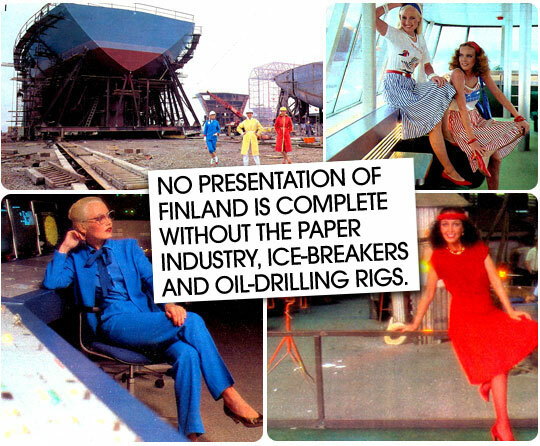 In 1989, Finnpap ordered another show named Paper Doll from Lenita Airisto for a large international customer event. Two major Japanese forestry, paper and pulp companies, Marubeni and Minatoya, booked the show for its stand at the Osaka World Design Expo 89. Later, Finnpap ordered a video of the performance for international distribution. The video is shown on this web site courtesy of the Forest Industry. The Lohja-based Elcoteq had discovered an electronics assembly plant in Lasnamäe, Tallinn, and wanted to present this first high-tech company in Estonia to its customers in the telecommunications, electronics and high-tech sectors. 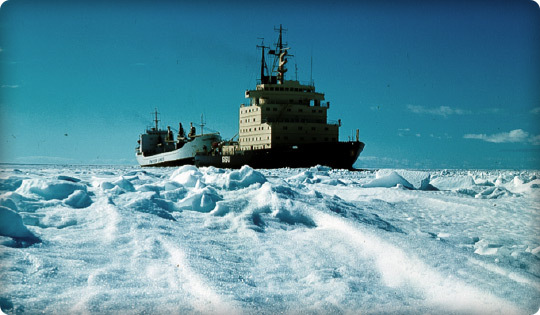 In 1993, Elcoteq invited some 250 guests onboard 70 boats to tour its new production facility in Tallinn. Elcoteq asked Lenita Airisto to plan and organize the Teleregatta reception at the Pirita Marina and a tour of the Tallinn plant. A video of the event was also ordered by Elcoteq. The video is shown on this web site courtesy of Elcoteq Plc.